Since the first century, Banda Islands has become single manufacturer of spices like nutmeg, pepper and so on. Banda island was visited by boats from China, India, and Arab. The spices is very precious and it's sold with the great benefit in the world market at the time. Although has a great reputation, Banda island is only a group of small islands consist of 3 large islands and 7 small islands. The Islands stands on the side of the deepest abyss in Indonesian archipelago, Banda sea. Waters here can reach the depth of over 6,500 meters. Two large islands, Banda Besar island and Naira island is habitat of many nutmeg trees. The third island called Mount Api is an active volcano. In the sea around these islands, you will find spectacular various marine parks. You can enjoy the coral beauty and colorful fishes, swim in the crystal clear sea, diving, snorkeling, and many more. Located 132 kilometers of southeast Ambon, the Islands is beautiful remote areas. With colorful coral reefs, warm sea, and exotic underwater life. Banda is paradise for the divers from all over the world to explore the most remote dive spots and very natural in the world. Nowadays, Banda has conjured the divers, sailors, and cruise ships from all over the world with its natural beauty. The beauty of Banda can be equated with Raja Ampat in Papua, another marine tourism paradise in the east Indonesia. Islands of Banda is one of the most popular tourist destination in Indonesia for the divers. Both expert and novice divers, everyone can dive from shallow lagoon between Banda Neira and Mount Api until the vertical wall in Hatta island. Wherever you go here, you will find amazing tropical scenery, incredible history, friendly citizen, and various types of coral reefs. Scuba diving is still new here, but the skilled divers isn't have to work harder to find its beauty. The underwater around Ambon and Saparua has several dive spots with world class reputation. When you explore the sea surface, you will see everything like shark, big turtle, napoleon fish, giant grouper, tuna fish, triggerfish, several species of whale, dolphine, great lobster until tame coral fish or endemic fish like "lepu ambon". Please come to Banda island and visit the secret behind its incredible scenery in the east Indonesia. Although the flight to Banda is seldom but it commensurate with the beauty of tropical paradise that you can't see in other places in the world. Diving is the main allure in Banda. Surrounded by crystal-clear water and exotic underwater life, Banda Islands is an ideal place for marine tourism. A group of colorful fish and other marine biotas will make the divers be amazed. The Islands have more than 25 dive sites, so you won't feel bored. Several popular places are Ai island, a beautiful place but you have to be careful of rough sea surface. There're also Batu Kapal, Hatta Reef, Keraka island, and Nusa Luat. Sailing is a right activity for you who want to conquer maritime boundary. Sail Banda is one of the most interesting activity because of hundreds of tourists will come here. Sail Banda surely already on your holiday schedule because if not, you will be disappointed to skip this event. This event will be attended by all sailor over the world that come to Banda to conquer extreme environmental conditions. Banda Neira is a quiet city with many trees along the roadside. You can walk and see the rest of ruins from colonial age. 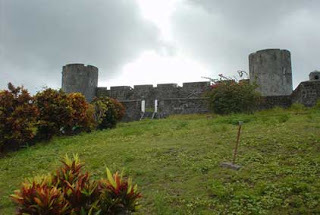 A renovated fort, Belgica Fort is a fort from 17th Century. You can go in and feel back to the period when the spices trade dominate this island. If you be patient to wait the best lighting you can get satisfying photography object. Try to get amazing scenery when the sun rises in Mount island (you have to climb the summit of Mount Api). Climbing for 90 minutes is a challenging activity and also some guides are available for your travel. Relax while swimming in south beach of Banda Besar or in Nailaka island. Enjoy your adventure desire by hiking and visiting many places like traditional village and old nutmeg forest. There're many other places for you to be explored in this remote island. Below are the best dive sites in Banda island. Sonegat : Sonegat is the closest place to dive, only 5 minutes by using boat from Hotel. Located in the middle of the sea between Banda Neira and Mount Api. Try to dive here between the long and steep sea wall by the lenght of 25 meters in rocky mountain. There are many large tunas here, also several species of girdled fish and angel fish. Keraka island : Keraka island or Kepiting island only 5 minutes from the north entrance of Neira-Mount Api. The vast sea sand on the north coast is suitable for picnic. In the south coast, 18 meters nder the sea, you will find small walls closed by hundreds of large tunicates where the colour mostly are blue and yellow. On the east coast, there are many various coral fishes and medium barracudas. Sjahrir island of Batu Kapal : Sjahrir island of Batu Kapal in the past known as Pisang island and Batu Kapal, only 20 minutes by using boat from Banda Neira. Both places are good combination for diving in the morning and evening, picnic, and many more. Lontar island : Lontar island, located in the outer edge, Lontar island is a part of the edge of sunken caldera that offers some amazing dive sites. Batu Belanda : In this place, you will find many barrels, foam tube, small caves, and rock crevice. Fish here is very variegated, include snapper fish, large emperor fish, blue angel fish, large finned fish, and many more. Ai island: Same with Hatta island, this island offers the best place in Banda for the divers. North beach and southwest beach of Ai island is surrounded by perfect coral walls, full of caves and habitat of harbors fish. In Banda Neira, most people go around to enjoy the scenery by walk or pedicab for the far trip. To cross from one island to other islands, you need to rent a boat. Boat rent price is relative, depend on the distance, start from Rp 120.000,00 until Rp 500.000,00. You can go shopping to buy some local handicrafts here, traditional food, or soft drink. Almost all food in Banda are traditional food. Available of local handicrafts made from marine products. The handicraft could be very interesting although it's large. Gem from Banda is beautiful souvenir for you and your couple. Fresh seafood that is taken from the sea is the best menu in Banda. The employee in inn will dish up seafood for you. Try to taste the typical grilled fish from Banda. Moreover, there're some small restaurants that provide various Indonesian food. 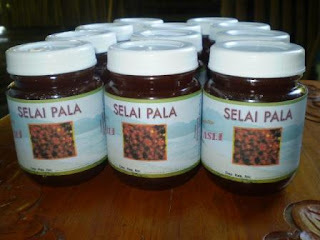 During your holiday time here, don't miss to try nutmeg jam. Nutmeg also available in food form which is preserved such as candied nutmeg and dried fruit slices. Other local foods are eggplant with almond paste and fish with nutmeg sauce. If you take a trip on December, try grape fruit that looks like olive but the taste is sweet. Many inns provide complete menu or special dinner. The easiest way to go to Banda is start from Ambon. Ambon, mother city of Ambon island, located 132 kilometers in the north Banda. To reach Ambon, you can fly directly from Denpasar that transit in Ujung Pandang. Lion Air, Batavia Air, and Mandala Airlines serve route of Ambon-Jakarta and transit in Makassar. From Ambon, you can go to Banda Islands by using small plane or using Merpati Airlines which fly to Banda Neira. Not available round-trip flight. The return flight must be through of Banda Neira. The flight operates once a week or every two weeks. So, this place is beautiful and quiet tourism object also ideal. Another alternative is by using ferry across Banda sea. Pelni provide ferry twice a week with ship KM Ciremai from Ambon to Bandaneira. Make sure you check the schedule twice for the unexpected changes. For travel tips, please read the explanation below. Diving is possible all year round, but when the wet season comes on July until September, you're limited to choose dive site. For the next information, you can open official web of Maluku Government at www.malukuprov.go.id. Contact number : 62 911 352 62 180 or 611 911341. There's no ATM or Bank around Banda Island include in Banda Neira so prepare cash money before you visit it. It is advisable to to save your money in the safe place, especially when you're in harbour or around it. The telecommunication is limited for XL and Telkomsel. You can fill in your pulse in Banda Neira. Newbie divers is suggested to be more careful for their safety because of the sea flow can be stronger in several places. Diving usually comfortable by the visibility between 15 until 30 meters in the calm water conditions, but in several dive sites only suitable for skilled diver. So, it's important to ask the suggestion. The depth of one dive place is approximately between 5 until 40 meter by the temperature between 26 until 29 celsius degrees, so make sure you have good body condition. Try to rent diving and snorkeling equipment from reputable company to guarantee your safety. The responsibility to check your equipments is depend on you. Please bring swimsuit and more clothes for a precaution. For the accommodation, stay in boat is an ideal way to explore Banda. You can choose to stay in cruiser for 7 until 14 days. Stay in boat is cheaper and don't need more times, especially if you want to explore dive sites as much as possible. Check into your travel agent to get the best dive package. Not too many hotels around Banda Islands. The biggest Hotel is located exactly near white sandy beach. Surely, you can stay in small hotel or inn with affordable prices with the best service. This is one of the right reason for you to stay longer in Banda. Hotel Maulana is the most luxurious hotel in Banda Islands. Princess Diana, Mick Jagger, and Jacques Cousteau ever stayed in the Hotel. Also available en-suite bathroom which overlook to pearl factory. Please call +62 911 210 24 for the next information. Mutiara Guesthouse has AC in its room with vast yard to relax. The price start from Rp 70.000,00 until Rp 125.000,00. Please call +62 813 303 4337 7. Vita Guesthouse is the right place if you expect detail information about special tourist destination in Banda. The guesthouse has personal dock which overlook to the Mount Api. You can rent boat and diving equipments. Please call +62 819 450 9011 0.